The feel-good cinema event returns! 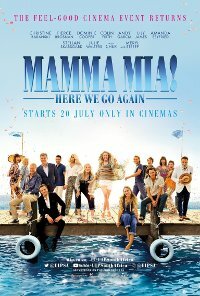 Arriving (and set) a decade after the original, this sequel-prequel to the crowd-pleasing Mamma Mia! kicks off with Sophie pregnant and running her mother’s villa. Feeling a bit overwhelmed, she researches her mother’s past, and learns how she managed to run the hotel, get to know each of her three possible dads, and made a success of it all. ABBA once again provides the songs. Parental Guidance 10-12 (Drug abuse). Language Isolated instances of low to mild impact crude language, including sexually suggestive utterances.